Review: Last year Michele Manzo released the stunning "Lonely Horizon" LP on Inner Ocean, presenting a widescreen vision of his take on contemporary boogie, funk and disco. 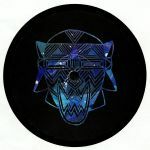 On this new 12" for Angis Music he's got the club squarely in his sights, not least on lead track "Burning Chrome". From the driving pulse of the rhythm section to the effervescent melodic content on top, it's a beautifully executed exercise in soul-stirring deep house with a disco tint. "Chiba City Park" has a more stripped back, jazz-licked vibe shot through with techno soul synth play, and "Nebula's Grace" takes things slow and low for a sumptuous chill out room trip.